Buying a puppy can be a wonderful experience or it can turn into a nightmare. Unfortunately the Harlequin Pinscher breed is being copied by several unethical Breeders. 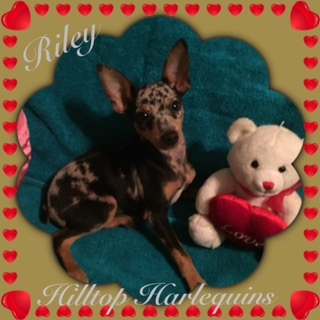 They are attempting to and have produced puppies with the merle, piebald and brindle patterns by cross breeding Miniature Pinschers with other breeds. Please beware of these frauds. There are also breeders that breed only for the money. Hopefully we can help you avoid some of the pitfalls of purchasing a puppy. If you have any concerns about a breeder, feel free to contact me and ask. ​Responsible and caring breeders will breed only registered dogs for registered pups. HPA registration is the only way to be 1/2 assured your getting a purebred Harlie. The newly implemented DNA and genetic testing will help keep our breed and it’s breeders as the best there is. ​​​​​​HPA is not responsible and can not help buyers get possession of animals and/or papers. It is up to the buyer to make wise choices in who they purchase a puppy from. Papers in hand at time of sale is the best policy. HPA can enforce its rules, ban or suspend individuals based only on information received. If you have a legitimate complaint of a breeder you must submit a notarized statement to the HPA. HPA/ACR has tolerated a lot over the years and went out of the way to HELP breeders correct their blatant disregard for the rules. In 2017 this will change. It’s time for the breeders themselves to take responsibility for their own actions, mistakes and disregard for the rules. HPA will be elevated as the PREMIERE Registry and the HPA/ACR Harlequin Pinscher as the HEALTHIEST BREED BAR NONE proved by available genetic testing. Established Breeder of the breed. Super Highway Breeder logo. These breeders have taken the responsible approach of testing our dogs for known genetic issues which can be tested for and have helped do the dirt-work to lay a strong foundation for the Harlequin Pinscher. Gold Super Highway Breeders – 5 stars – Only those breeding HPA registered – Tested CLEAR breeding stock. (*HPA registered – CLEAR). Bronze Star Breeders – 3 stars – Those breeding HPA and/or ACR tested breeding stock and also breeding undocumented Harlies/Min Pins (*unregistered) whether tested or not. Registration papers. All ethical breeders should have papers on their puppies to prove the puppies lineages. Puppies without papers could be said to be anything with no proof to back it. 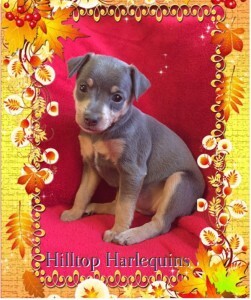 When purchasing a Harlequin Pinscher look for HPA registration. 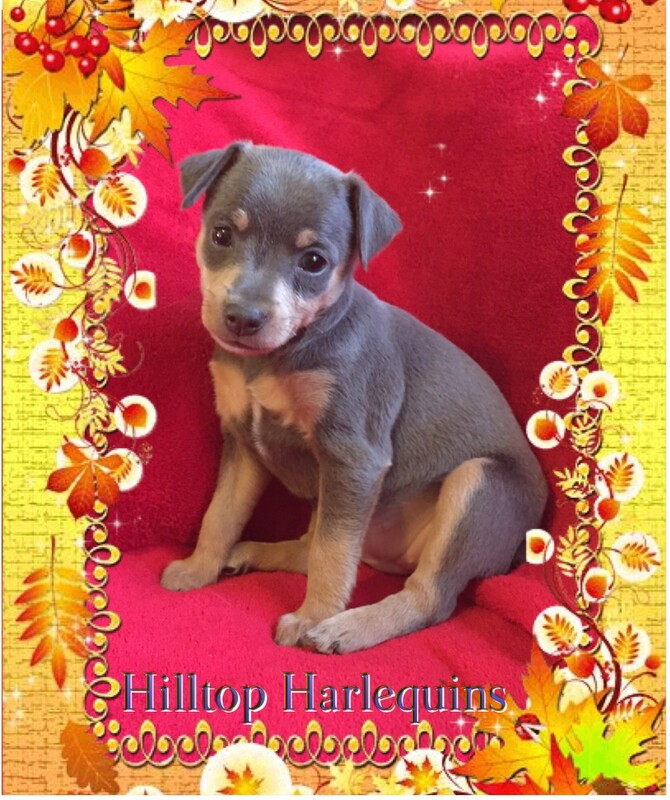 HPA is the registration of choice for responsible Harlequin Pinscher breeders and the only registry that recognizes the true Harlequin Pinscher. Papers cost the breeder money thus the reason most go without them. ​​Puppy Pictures. Pictures can say a lot for a breeder. Puppies of ethical breeders will be clear, clean, well groomed and presented nicely in pictures because they care. Some breeders aren’t real smart at times either as you will often times see in their pictures of crates stacked up so you know their dogs live in those small crates – How sad for the dogs being subjected to that type of restricted life. Blurry or fuzzy pics, poop in the pics, junk in the background, proud beer drinkers, bad language to half dressed individuals. ALL of this paints a picture and not a very good one in my eyes. Are these puppies actually what the seller say they are? I try not to judge but it’s hard to overlook things that distracts from the puppy itself. Purebred Breeder. Purebred breeders selectively breed their dogs for desired traits and record them accordingly. When the lineage of a purebred animal is recorded, that animal is said to be pedigreed. Those breeding mixed breeds without working toward a documented NEW breed are only adding to the rescue and pound problem of homeless dogs. Breeding to an ETHICAL standard. Not every puppy can be breed standard and unfortunately breed standards seem to be a revolving door with SOME registries but if a breeder is breeding sub-standard dogs to begin with then they are NOT looking to better the breed. AVOID purchasing from bleeding heart breeders who think their defective pups are worth reproducing. Alopecia, cleft palettes, twisted spines, under bites are ALL genetic. Please do not reward a breeder producing defective pups and who continue to knowingly use parents with defective genetics by buying pups from them. Credit/Debit Card Payments. These are a tool many breeders use to get buyers to make quick decisions and they know the more convenience they give buyers to make payment the more likely they are to snag them. The HPA does not recommend the use of PayPal Services as a Safe Method of PURCHASING a live Animal as the PayPal Policies state they do NOT Cover the Sale of Live Animals. CASH PAYMENTS IN PERSON & PERSONAL PUPPY PICK UP. ​You can’t beat Cash Payment in Person with Personal Puppy Pick Up. Hands-Down the best way to get a puppy even if you have to drive a ways to do it. Genetic and DNA Testing ON FILE. An ETHICAL breeder breeding to better the breed is going to be financially out a minimum of $300.00 per dog in testing before they even breed it the first time. Excuses are just that: “Excuses for NOT making sure their dogs are clear of known diseases they can avoid through testing and breeding ONLY clear tested animals. Purebred AKC dogs can not produce Piebald genetics. Please do not be taken by anybody claiming otherwise. Want to see Quality? Below is a 11 year old Stag red female bred by me. The notices below are issues that have came about in regards to the Harlequin Pinscher. They are for your viewing and hopefully will help you ADVOID the unethical Breeders and they will eventually fade away. It’s is considered highly unethical to breed merle to merle. The merle gene is considered semi-lethal and when you breed merle x merle you stand the chance of producing Double Merles when a pup receives a Merle gene from each parent. These double merle pups can die inutero which can put the Dams life at risk. 25% of all double merles are born, deaf, blind or deformed. Double merles often have health issues their whole life and have a much shorter lifespan. Anybody having both male and female Merles must take the responsibility of KNOWING they can keep them separate and not breed them together. HPA has a strict policy on not registering a Merle x Merle litter to discourage such practices. If you purchase a Merle, brindle or Piebald puppy without HPA papers then you’ve more than likely will be purchasing a cross bred dog which is NOT a Harlequin Pinscher. Harlequin Pinschers are a purebred developed breed unto themselves and will have HPA papers with a documented lineage. NO EXCEPTIONS!! A purebred AKC, UKC, CKC Miniature Pinscher can NOT produce piebald, merle or brindle offspring. Genetically NOT possible. Don’t be taken by anybody claiming otherwise. If the Harlies you are buying aren’t HPA registered then chances are you are buying pups from unethical breeders. There are several unethical dog Breeders claiming to have Harlequin Pinschers. Know the facts BEFORE you put a deposit down on a puppy. Don’t be fooled! There are some merle patterned puppies out on the market at this time that are being said to be Merle Min Pins but they are obviously NOT HARLEQUIN PINSCHERS. They are Merle in pattern, have Chihuahua heads and Chihuahua legs. If it looks like a Chihuahua, walks like a Chihuahua and is NOT HPA registered then my guess is that it is a CROSS with a CHIHUAHUA. They are being advertised as CKC registered. Please don’t be taken by this breeder. If somebody tells you their Harlies are BETTER than anybody else’s yet they have no papers, no testing results and are KNOWN to have a lot of genetic issues in their bloodline …… well all I can say is RUN . don’t walk, don’t be political correct and polite!!!!!! RUN …… If they tell you their Harlie is AKC then again …. pick up your pants legs and Run – don’t stumble as frauds like those are hoping you will and pay them for a highly possibly bred crossbreed dog of unknown breeds with lots of health issues. If their dogs aren’t tested and HPA registered then expect to get taken for a ride if you buy from them.- Nancy A.